I don't think anything could have prepared me for the mystical wonder of this lost city. To think - this wasn't even on my itinerary! I found out about Petra through the other volunteers working with me, and the guests at the Overstay Hostel in Tel Aviv. When I got to Israel, all I really knew about visiting was Jerusalem and the Dead Sea... I had no idea where to go or what to do apart from those two. Having travelers as your constant companions help a lot! I kept hearing "Petra" and how amazing it was from other people who've already been there, so I managed to sneak it into my schedule before leaving for the UK. So, from Tel Aviv, my friend, Christina, and I took a 5 hour bus ride south to Eilat. That's where you cross the border from Israel to Jordan (the easiest one at least). We spent the night in Eilat, and woke up early to deal with the border crossing in the morning. Throughout my travels, I've met a few people who have hitchhiked their way from place to place, and my usual reaction is a disapproving "ts tsk". Most of them are men. If I meet a woman who hitchhikes, my reaction is a severe gasp with a dramatic "<Insert name of female here>???!!!???" It's just that - it's common knowledge that if you hitchhiked in the States, there is a statistical probability that you will end up in a duffel bag... and I NEVER take those kinds of risks. I don't want to end this journey on this Earth just yet. But apparently... in Israel, and in Jordan, hitchhiking is an accepted form of transportation. Most, if not all of the female travelers I've met in Israel claim to have hitchhiked more than once, and they've all had pretty good experiences. When Christina suggested that we hitchhike our way to the border from our hotel to save some cash, I had my reservations, but I have to admit, I was mildly curious. It would be another "FIRST" for me. We waited for 15 minutes or so, until a nice elderly gentleman took us in, got us lost for a few minutes, but brought us to the Jordanian border safely. It was a little anticlimactic, but I'm glad I'm still here with all of you, alive and well to tell the story. All I really know (and really NEED to know) about Petra is that it is an ancient archaeological city, it's a UNESCO World Heritage Site, it was considered the 7th Wonder of the World, and it was featured in the movie, Indiana Jones. Honestly, after setting foot in it, I understood why. I was in absolute awe. Well, Petra is basically in the desert. It's the complete opposite of what I usually would like... especially since I didn't really like Dubai very much... but I was utterly and completely blown away by it! I felt like I was in a Star Wars movie... or in Agrabah (fictional city from Aladdin)! Just know this: Petra is probably one of the most MAGICAL places I have ever seen. It definitely should be on YOUR list of places to visit before you die. Paying 55 Jordanian Dollars to enter and explore Petra for 2 days is TOTALLY worth it. 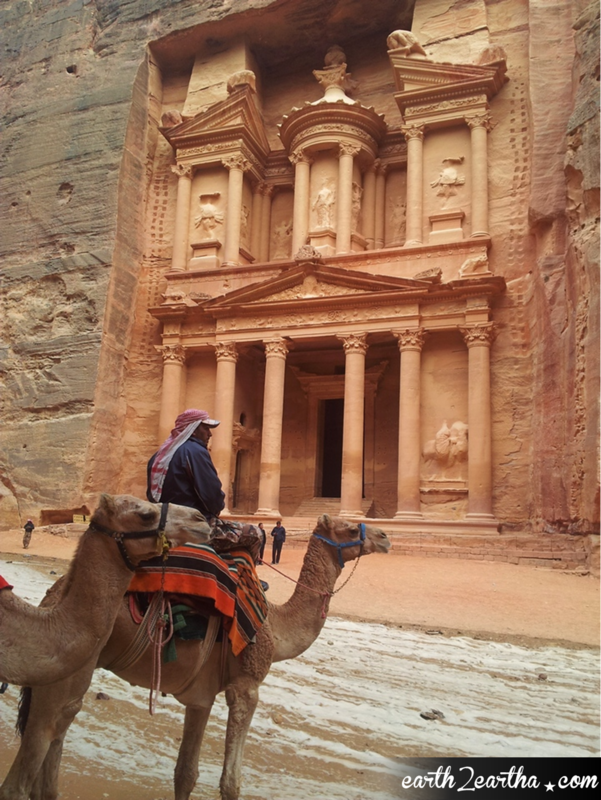 And I consider myself so lucky... SOOO LUCKY, to have been able to see and experience Petra in this lifetime. Petra is absolutely, breathtakingly, incredible. More adjectives to accompany more photos below. This is the view of Wadi Musa. The city right outside Petra. One of the best Sunsets I've ever seen. These are the tents we stayed at in the Bedouin Camp - where we camped for the night. AMAZING. My first attempt at hitchhiking was so successful, I wanted to try it out with a donkey! 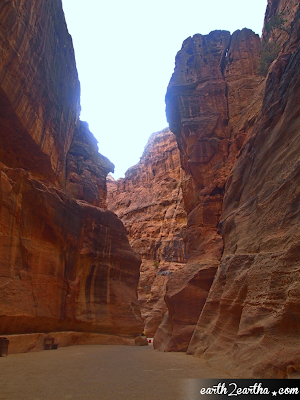 This is the Siq - which is the main entrance to Petra. 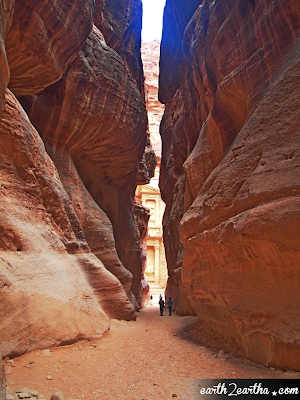 It's a mile long narrow gorge that leads you to the ancient city. I didn't realize how far this walk was, but honestly, even the Siq is worth visiting. See what I mean? That's not even Petra yet, and already, it's ASTOUNDING! This is one of my favorite moments. SPELLBINDING! A Star Wars Movie Set Piece! With my friend, Tiffany. I don't know what we were looking at, but it looked FASCINATING! 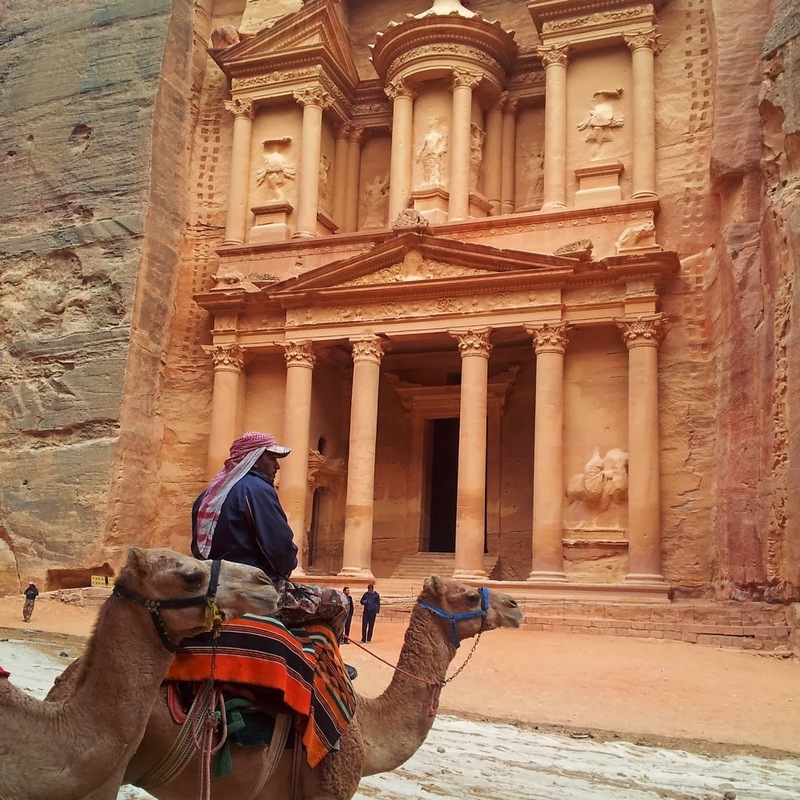 Camels in front of Catacombs! MARVELOUS! A random view of... I'm not sure what... But it's SPECTACULAR! We had to climb up 850 steps to get to a place called The Monastery. It was like Cinque Terre all over again, I'm telling ya. Took a break for a quick photo... Those are my travel buddies, Kamal and Tiffany. And VOILA! We made it!!! THIS is The Monastery :) Pretty IMPRESSIVE! View from the Top. BREATHTAKING. 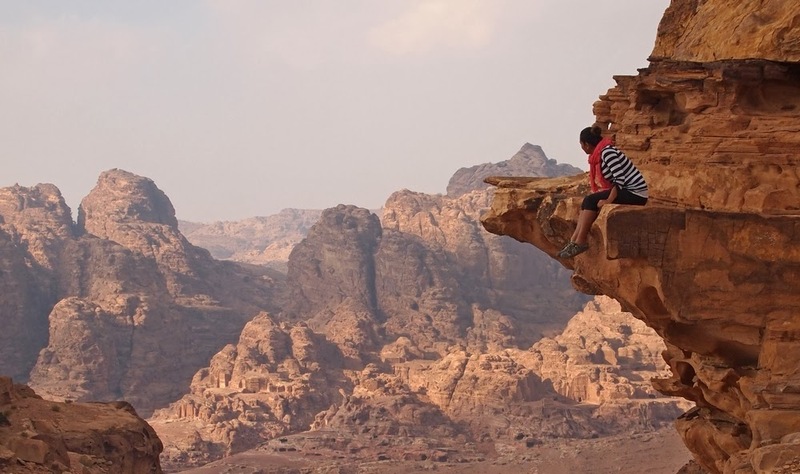 PETRA BY NIGHT is a mini excursion you can take for 12 Jordanian Dollars. What it is is that they light up the Siq with candles at night, and you walk through it until you reach The Treasury, which will look like this photo above. They play some authentic music and there's a man that tells a story while everyone is gathered up in front of the lights. It's pretty STUNNING... just difficult to take photos because it's really dark. And there you have it, ladies and gents! These are some of the best photos I've taken this year. I wish I could share ALL of the 2000 photos I took, but I don't think my blog has enough bandwidth. The only solution for you is to go... Go and take 2000 photos of your own. Honestly... There is just SOMETHING about Petra that captures you. The energy, the history... just walking down the Siq already gives you a feeling of anticipation. Like, your body knows you are about to experience something great. It's very mystical... Very mysterious. I can't explain it properly. You'll know when you get there. You'll see what I mean.